Dickens and London was always going to be a challenge for the Museum of London. Should they focus on Dickens’ work, the London he lived in or the connection between the two? And should they assume their visitors know his works intimately or not? The exhibition team have made a laudable effort, with the end result including a number of potential show-stopping objects and experiences. Overall, though, I feel the exhibition betrays some of these tensions about the nature of the subject being presented. It is also – dare I say it – a little wordy. First the good stuff… If you’re a Dickens geek you won’t be disappointed. You can see the chair and desk where he wrote Great Expectations and Our Mutual Friend, along with his quill and inkwell. The case containing the latter, along with letters and a cheque written in Dickens’ own hand was surrounded by eager visitors all the time I was there. Sensibly, the exhibition designers have spread the manuscripts of various Dickens novels (which are on loan from the V&A Museum) around the entire space, making it much easier to spend time scrutinising them. As a publisher, I was particularly interested to see copies of corrected proofs alongside the hand-written manuscripts. They had hardly a change on them, only the odd comma or semi-colon inserted here and there. Either the typesetters of the day were brilliant at their craft (and it can’t have been an easy task to understand Dickens’ tiny and oft-corrected scrawl), or the author was well aware of the likely cost of more major changes. For someone who knew very little about Dickens the man, I learned a smattering of interesting facts. He had, I was surprised to discover, originally wanted to become an actor, and visited the theatre every single night between the ages of 14 and 17. All his life, we’re told, “he remained an actor at heart”. Despite being inspired by “the variety and complexity of the city” and keenly listening to sounds and conversations, he “found distractions, such as church bells and street musicians, particularly annoying”. He was also, like many men of his time, somewhat of a philanthropist, setting up a home for destitute young women in West London, among other charitable endeavours. Despite this public concern for the poor, Dickens kept his own blacking-factory childhood secret, only to be discovered after his death. The exhibition really focuses not on the man, however, but on London, otherwise described as Dickens’ “muse”. And this is where I feel the kinks start to show. In some cases it works well. For example, an impressive self-supporting door from Newgate Prison is linked to a passage from Barnaby Rudge and a child’s shroud cap is related to Little Dorrit. I haven’t read either book, but I understood why these objects were on display, and they brought the world that Dickens wrote about into sharp focus for me. At other times, the connection seems more tenuous. Having discovered Dickens’ penchant for the theatre, we then encounter a sign from the Theatre Royal Drury Lane, a toy theatre model (which is, admittedly, very handsome) and a clown outfit. Similarly, since Dickens was the “first author to describe the railway’s impact on society, the city and countryside” we are shown an 1848 Bradshaw’s railway companion and a receipt from a stage coach. In each case, these items seem extraneous to the main thrust of the exhibition, or to Dickens’ work. What’s more, they seem to be given more space and attention than many other interesting – and relevant – pieces. The amazing London scenes captured by nineteenth-century photographers like Henry Dixon and Henry Flather are all consigned to small screens squeezed around the gallery. I felt these deserved as much space and time as the specially-commissioned immersive film at the start of the exhibition, which was projected on to three separate walls in the first zone of the gallery. 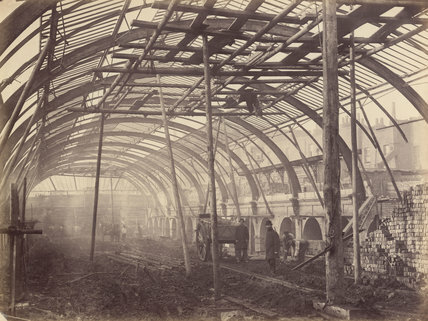 Henry Flather’s 1867 photograph of the construction of Bayswayer Station. Copyright: Museum of London. This probably reads OK on a blog post (and would certainly work in a book), but for a museum exhibition it is far too long, especially since this is only a third of the entire label. We could have gleaned the point from a fraction of the words, or drawn our own conclusions from a more engaging display of the names. The impact on my fellow viewers was clear. “It’s all a bit dreary,” one said; another was surpised to see that people were “still out” at three o’clock in the morning. Overhearing these snatches of conversations beautifully illustrated the longevity of Dickens work – and the constant ability of the “wealth and beggary, vice and virtue”* of the city of London to shock.